The Arab Republic of Egypt is one of the most populated countries in Africa and a land bridge to Asia. Spanning some 386,560 square miles, it borders Libya to the west, Sudan to the south, and Israel and the Gaza Strip the east. Its northern coast borders the Mediterranean Sea and its eastern one the Red Sea. 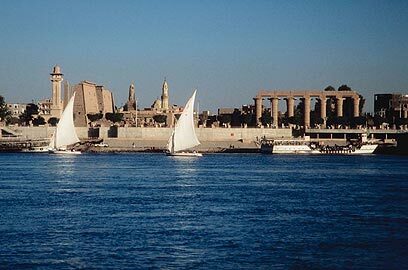 The majority of Egypt's population – some 78 million people – lives near or on the banks of the River Nile, and where the only arable agricultural land is found. About half of Egypt's residents live in urban areas, most in the greater Cairo area, Alexandria and other major cities in the Nile Delta. Government: Egypt is considered the most prominent among Arab nations. The Egyptian Republic was declared on 18 June 1953 with General Muhammad Naguib as its first president. Naguib was forced to resign in 1954 by Gamal Abdel Nasser, who declared the full independence of Egypt from the United Kingdom on June 18, 1956. He was succeeded by Anwar Sadat in 1970 and the latter was followed by Egypt's ousted ruler, President Mohamed Hosni Mubarak, who came to power in 1981. 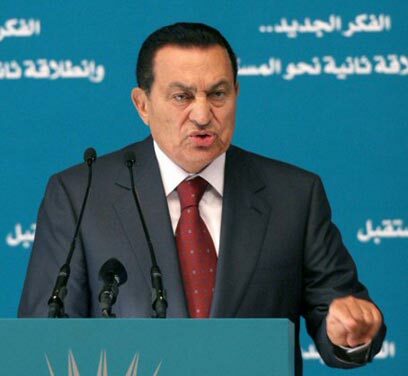 Mubarak headed the National Democratic Party which holds 88% of the parliament's 454 seats. The rest of the seats are divided between the opposition (4%) and independent politicians (8%). The National Democratic Party's biggest opponent – the Muslim Brotherhood, has no parliamentary representation – the movement was outlawed in 1954. Religion and academia: The majority of Egyptians are Arabs and 90% of them are Sunni Muslims; about 7% are Copt Christians, a denomination unique to Egypt, belonging to the Coptic Orthodox Church of Alexandria. 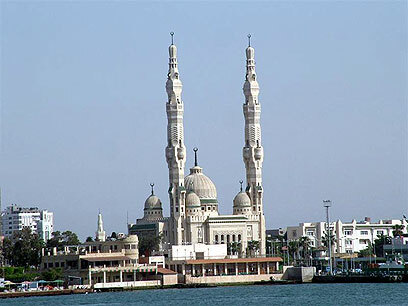 Egypt in considered an international Arab center for academics and scholars, and is in the forefront of Arab culture as far as literature, media, music, theater, and cinematography are concerned. Egypt is home to 13 universities, among which are the renowned Cairo and Alexandria universities; it has mandatory education for grades one through six, and provides free education for children ages six to 15, and still – 40% of its rural population is illiterate. 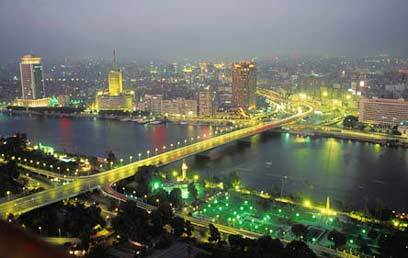 Economy: Egypt's economy depends mainly on agriculture, media, petroleum, phosphate, iron and mangan-neptunite exports; textiles and tourism, which account for about 50% of the country's gross domestic product. Another important staple of Egyptian economy are its harbors – the Port of Alexandria, Port Suez and Port Sa'id. The Arabs first came to the area now known as Egypt in 642 AD. Considered by the local residents as emancipators from the oppression of The Byzantine Empire, they – and their religion of Islam were welcome. In 969 AD the Shiite Fatimid Dynasty took over the country. The Fatimids established the new Egyptian capital of al-Caira (the victorious) and during their 200-year rule the country flourished, expanding its bordered to the coast of Sicily. The year 1169 saw Salah a-Din come to power. Hailed as a champion of Orthodox Islam, he returned to the religion's Sunni fundamentals in 1171, but never claimed the religious title of Caliph – opting for the secular title of Sultan instead. Under his rule Egypt regained control of Jerusalem and eventually expanded its borders to Mesopotamia. Salah a-Din's rule was followed by that of the short-lived Ayyubid dynasty. In 1250 the Mamluks ("the possessed") seized control of Egypt, Israel and Syria from the Ayyubids, instating a dynasty of 47 sultans. The Mamluks established Cairo as their capital and by the 14th century had turned it to the Muslim world's most revered religious center. The Ottoman Empire toppled the Mamluk's independent rule in the 16th century, but they were allowed to continue their rule as the Turks' representatives. In 1798, Napoleon conquered Egypt, but the Turks regained control of the region in 1831, when Muhammad Ali led an Egyptian uprising against the Ottoman Empire, making it pseudo-independence, under Ottoman rule. Ali expanded Egypt's borders once more, pushing them to Israel, Syria and northern Sudan. After his death in 1849 he was succeeded by his descendants, who remained under various kinds of Ottoman rule until 1914 – despite the British taking over the country in 1882. In 1922 Egypt declared itself independent and King Fuad ascended the thrown. The UK retained the right to keep troops in the country until 1936. In May of 1948 Egypt, along with her neighboring Arab nations, invaded the newly formed State of Israel. When Israel's War of Independence was over, the two signed a ceasefire agreement. In 1952 a military coup swept the country. King Farouk of Egypt was dethroned and Muhammad Naguib became the first President of the Republic of Egypt. He was removed from office in 1954, by Gamal Abd al-Nasser. Nasser's Egypt: Nasser introduced a social regime, nationalizing personal assets and pushing agrarian reforms. Under Nasser, Egypt became a force to be reckoned with both in the Middle East and in Africa; and turned into an industrially advanced modern country. Nasser also purged the old regime's ranks, outlawing the radical Muslim Brotherhood movement. In 1956, Nasser nationalized the Suez Canal, causing Egypt's relations with the UK and France – which were co-owners of the sailing rights – to spiral. France and the UK ordered Egypt to remove its forces from the Canal, and when it refused, the British and French air forces launched an aerial assault on Egyptian airports and strategic military facilities built in the Canal's vicinity. Israel was soon drawn into the fighting, which turned into the Israeli-Egyptian Sinai War. In November 1956, the British and French launched Operation Musketeer: Joint forces invaded Port Sa'id by air and by sea, taking hold of part of it before a ceasefire was called. The UN soon ordered the UK, Israel and France to retrieve their forces and leave Egyptian soil. In 1958, Egypt allied forces with Syria, as the two signed the United Arab Republic treaty, making them a single political entity. The treaty ended in 1961. In 1962, Egypt intervened in a civil war which broke out in Yemen, nearly warring with Saudi Arabia in the process. The Six Day War, in which Israel defeated Egypt broke out in 1967 and in 1969, another Israeli-Egyptian altercation broke – the War of Attrition, which was left undetermined, since the US made both sides cease fire. Sadat's Egypt: following Nasser's death in 1970, Muhammad Anwar El Sadat became the Egyptian president. Soon after taking power, Sadat began trying to restore Egyptian control over the Suez Canal and the Sinai Peninsula, including laying out military options to that effect. In 1971 Sadat reshuffled Egyptian politics, when he accused leading figures in the country's Left and many of Nasser's loyalists of conspiracy, trying them for treason and forcibly removing them from power. Sadat also began mass recruiting efforts, in an attempt to "dust off" his military ranks. In 1972, when his continuing attempts to acquire advanced soviet weapons systems failed, he had all military Soviet advisors in the Egyptian army removed from service, prompting the Soviet Union to tighten its military ties with it. In 1973 Sadat decided the time had come to launch another attack on Israel. Along with Syrian President Hafez Assad, he devised a plan of attack, which included mass use of anti-aircraft missiles, surface-to-air missiles and new infantry techniques. Israel was aware of the joint Syrian-Egyptian maneuvers, but assumed it was just that – a military drill. Egypt and Syria launched a surprise attack on Israel in October of 1973. The Yom Kippur War started with enemy forces having the upper hand but the Israeli forces soon bounced back, pushing the Egyptian forces back and crossing the Suez Canal into Egypt. Despite the Egyptian forces' failure in 1973, Sadat was seen as the leader who redeemed Egypt from its humiliating loss to Israel in 1967. 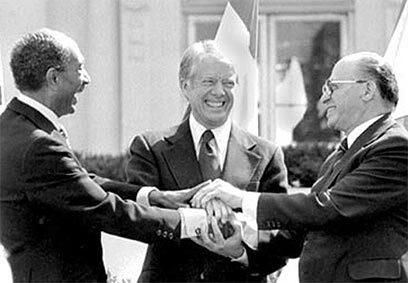 Sadat's policy towards Israel in the years to follow became moderate, culminating in an official state visit to Israel in 1977 and the Israeli-Egyptian peace treaty in 1979. The two formed embassies on each other's soil and established commercial relations. Egypt was harshly criticized by the Arab nations for signing a peace treaty with Israel and some of them even declared a political boycott on it. Nevertheless, Egypt's peace with Israel had a vast influence on its economy, increasing the revenue derived from tourism while decreasing its defense expenditures. Egypt regained control of Sinai's oil field and the Suez Canal reopened for commercial sailing. Sadat's financial beliefs were far from Nasser's socialism: He encouraged foreign investments from the West, allowed free economic entrepreneurship and minimized the government's involvement in the financial scene. In 1975 Sadat allowed various factions within Egypt's ruling Socialist Arab Union party to form freely. In 1978 he founded the Egyptian National-Democratic Party, which replaces the SAU. Sadat was assassinated by Muslim extremists in 1981, during a military parade. President Sadat was saluting the troops when a small group of them ran from one vehicle in the parade and started firing machine guns and throwing grenades in the stands. Egyptian President Hosni Mubarak came to power in the aftermath of Sadat's assassinations. Unlike Sadat, Mubarak halted the financial liberation and free-market mode and reinstated strict government monitoring of the economy on one hand and allowed more political freedoms on the other. Egypt has continued to grow financially, especially thanks to its booming tourism, but due to the natural rate of procreation, the financial growth has yet to meet the population's needs. Mubarak was able to rehabilitate Egypt's standing among the Arab nations, repairing the so-called damage signing a peace agreement with Israel caused to its ranking in the Arab world, making it a political force to be reckoned with once more. His foreign policies made for stronger relations with the US and Russia, and he led a battle againt the radical Islam movements within Egypt. In May 2005, mostly due to the US pressuring Mubarak to democratize Egypt further, the Egyptian constitution allowed candidates outside the ruling party to take part in the presidential elections. Several of the opposition parties boycotted the elections, claiming they were only pseudo-democratic and that they did not give any other presidential candidate a real chance. Mubarak went on to win 85% of the votes. Mubarak made sure Egypt remained part of almost every aspect of the Israeli-Palestinian peace process, acting as a mediator between the sides in more than one occasion. Despite notable political pressure, both from within Egypt as well as from other Arab nations, he upheld Egypt's peace with Israel, although the relations between the two remain far from true normalization. Hosni Mubarak was elected Egypt's president four times – in 1987, 1993, 1999 and 2005. Although Mubarak always denied the possibility of any succession of power in Egypt, it was widely speculated that when he decided to step down, or in the event of his death while still in office, his son Gamal Mubarak – who served as currently the NDP's deputy secretary general – would be sworn in as president. Mubarak resigned as president and transferred authority to the Supreme Council of the Armed Forces on February 11, 2011, after 18 days of violent protests calling for his resignation. Mubarak and his family left the presidential palace in Cairo and moved to Sharm el-Sheikh, Egypt.